A late blooming, vigorous growing tree. 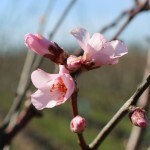 The flowers are profuse, and dark pink. The nut is more bitter than the commercial varieties. It is self-fruitful. (800 hours chilling). 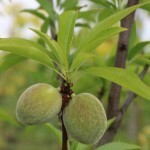 Almonds need full sun and a well-drained soil.